This past Friday afternoon, the chanichim (campers) of Ilanot had some time to prepare for Shabbat. They exchanged notes wishing each other a wonderful Shabbat (known at camp as “Shabbat-o-grams”) and dressed up in anticipation of a long awaited first Shabbat at camp. Even though many of our chanichim are returning campers this summer, many of them expressed their excitement and joy of being back. On Shabbat morning, our chanichim gathered for t’fillot (services) and sang their hearts out. They learned new tunes and new songs that they continued to sing throughout Shabbat. During the afternoon, there were three-four activity options at all times on Tzad Aleph (A-Side). Chanichim chose which activities to participate in and had a great time! 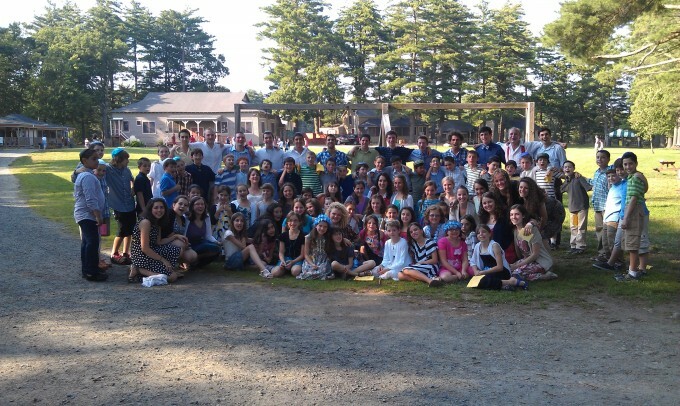 Before dinner, we had a beautiful Peulat Shabbat (Shabbat Activity) where chanichim learned about camp as a holy place. Through games and discussion, we learned about what kinds of items we call holy, how an environment can be holy, and how people can make a place holy. Chanichim spoke thoughtfully and openly during these activities. We were so impressed! Below is a picture from right before Shabbat! Here’s Edat HaIlanot!